Role-playing adventures in the Wild West. This role-playing game takes the OGL, shakes it up and lets only the necessary stuff back in again. What this means is that you are left with a straightforward, no nonsense role-playing game without feats and skills. It does feature a simple class-based system (Drifter, Gunslinger, Preacher and Wrangler to name just a few of the 10 character classes), so it has that 'old school' feel with a more modern slant. It is so easy to use, it can just as easily be used as a simple gunfight/skirmish game with as much or as little of the role-playing element as you like. If you like feats and/or skills, these can be taken from the SRD or any other OGL or d20 game you happen to like and slotted straight in seamlessly. 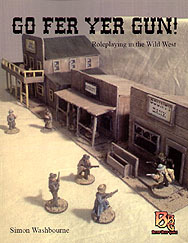 Included in the game are several pages devoted to 73 real-life Wild West characters, 3 adventure ideas, a character sheet and rules for multi-classes.